St. Petersburg is a neighbor city of Tampa, located ~20 miles southwest of Tampa. There are great running options in St. Pete, though they are somewhat geographically dispersed. A popular and attractive running option in St. Pete is the Bayside waterfront area, where you get spectacular views of Tampa Bay and the city. A great 8-mile loop starts at Pioneer Park next to the yacht club, and heads north along the beautiful waterfront. 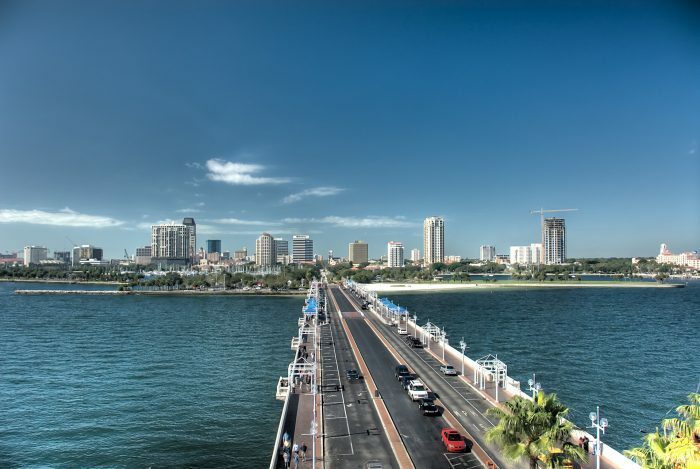 St. Pete Pier, located out in the water at 2nd Avenue NE, offers panoramic views of Tampa Bay. Along the northeast part of the route in Snell Isle, you pass by some attractive mansions and waterfront homes, especially on Brightwaters Boulevard. Looping back passes by some of the historic neighborhoods of St. Pete.